[S9] Ancestry.com, 1860 United States Federal Census (n.p. : Online publication - Provo, UT, USA: Ancestry.com Operations, Inc., 2009. Images reproduced by FamilySearch.Original data - 1860 U.S. census, population schedule. NARA microfilm publication M653, 1,438 rolls. Washington, D.C.: National Archives and Records, unknown publish date), Year: 1860; Census Place: Montezuma, Cayuga, New York; Roll: ; Page: 732; Image: 255. [S1] 1870 United States Federal Census, online , Year: 1870; Census Place: Township 56 Range 20, Chariton, Missouri; Roll: M593_; Page: ; Image: . Find A Grave Memorial# 87179159. [S26] 1900 United States Federal Census, online , Year: 1900; Census Place: Jefferson, Linn, Missouri; Roll: T623_871; Page: 4A; Enumeration District: 79. [S2] 1880 United States Federal Census, online , Year: 1880; Census Place: Laclede, Linn, Missouri; Roll: 700; Family History Film: 1254700; Page: 479B; Enumeration District: 184; Image: 0161. 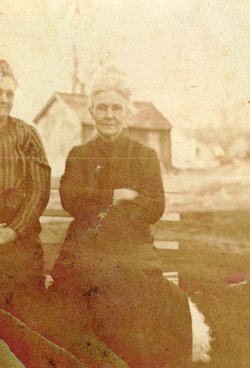 [S38] Find a Grave, online , Mary Smith PeaseBirth: unknown Death: Feb. 15, 1904Family links: Spouse: William Wheelock Pease (1829 - 1899)* Burial: Unknown Created by: LBS Record added: Mar 21, 2012 Find A Grave Memorial# 87179159. [S926] Ancestry.com, Web: Missouri, Find A Grave Index, 1812-2011 (n.p. : Online publication - Provo, UT, USA: Ancestry.com Operations, Inc., 2012.Original data - Find A Grave. Find A Grave. http://www.findagrave.com/cgi-bin/fg.cgi: accessed 12 January 2012.Original data: Find A Grave. Find A Grave. http://www.findagrave.com/cgi, unknown publish date). [S1048] Familysearch.org, New York Probate Files 1829-1921, unknown repository, unknown repository address, "New York, Probate Records, 1629-1971," images, FamilySearch (https://familysearch.org/pal:/MM9.3.1/…,216804501 : accessed 14 Oct 2014), Cayuga > Estate papers 1799-1905 box 71 > image 448 of 1374. [S38] Find a Grave, online , William Wheelock PeaseBirth: Feb. 6, 1829 Death: Dec. 17, 1899 Family links: Spouse: Mary Smith Pease (____ - 1904) Children: Ezra W Pease (1853 - 1935)* Phoebe/Phebe Isabella Pease Fifield (1856 - 1953)* *Calculated relationship Burial: Laclede Cemetery Laclede Linn County Missouri, USA Created by: LBS Record added: Oct 03, 2011 Find A Grave Memorial# 77522213. Montezuma. March, l6.—William Pease, a resident of this town 10 years ago, died at his late residence in Laclade, Missouri, March 11 aged 70 years. Mrs. Pease is a sister of Mrs. Cordelia Trufant, of this village. Find A Grave Memorial# 98686941. Jeannett Ashley married Smith William Pease, son of William Wheelock Pease and Mary Ann Smith. [S927] Unknown author, Missouri Digital Heritage:Death Records (n.p. : n.pub., unknown publish date), Death Certificate Image. [S75] Ancestry.com, World War I Draft Registration Cards, 1917-1918 (n.p. : Online publication - Provo, UT, USA: Ancestry.com Operations Inc, 2005.Original data - United States, Selective Service System. World War I Selective Service System Draft Registration Cards, 1917-1918. Washington, D.C.: National Archives and Records Admini, unknown publish date), Registration Location: Linn County, Missouri; Roll: 1683400; Draft Board: 0. [S26] 1900 United States Federal Census, online , Year: 1900; Census Place: Jefferson, Linn, Missouri; Roll: T623_871; Page: 5A; Enumeration District: 79. [S928] Ancestry.com, Missouri Marriage Records, 1805-2002 (n.p. : Online publication - Provo, UT, USA: Ancestry.com Operations, Inc., 2007.Original data - Missouri Marriage Records. Jefferson City, MO, USA: Missouri State Archives. Microfilm.Original data: Missouri Marriage Records. Jefferson City, MO, USA: Missouri Stat, unknown publish date). [S930] Ancestry.com, Irish Immigrants: New York Port Arrival Records, 1846-1851 (n.p. : Online publication - Provo, UT, USA: Ancestry.com Operations Inc, 2001.Original data - Famine Irish Entry Project, 1846-1851. Washington, D.C.: National Archives and Records Administration.Original data: Famine Irish Entry Project, 1846-1851. Washington, D, unknown publish date). [S929] Ancestry.com, New York, Passenger and Immigration Lists, 1820-1850 (n.p. : Online publication - Provo, UT, USA: Ancestry.com Operations Inc, 2003.Original data - New York. Registers of Vessels Arriving at the Port of New York from Foreign Ports, 1789-1919. Washington, D.C.: National Archives and Records Administration. M237, roll, unknown publish date). [S520] St. Joseph's, Fleming, Genweb Transcription, Url: Rootsweb.com/~nycayuga, online <http://web.archive.org/web/20020225192343/www.rootsweb.com/…>, Pepper Bridget 12/14/1881 Ireland 6-D 80 1-S Montezuma,N.Y. Inflamation. [S2] 1880 United States Federal Census, online , Year: 1880; Census Place: Mentz, Cayuga, New York; Roll: 814; Family History Film: 1254814; Page: 159C; Enumeration District: 027; Image: 0240. [S26] 1900 United States Federal Census, online , Year: 1900; Census Place: Mentz, Cayuga, New York; Roll: T623_1013; Page: 19B; Enumeration District: 33. [S9] Ancestry.com, 1860 United States Federal Census (n.p. : Online publication - Provo, UT, USA: Ancestry.com Operations, Inc., 2009. Images reproduced by FamilySearch.Original data - 1860 U.S. census, population schedule. NARA microfilm publication M653, 1,438 rolls. Washington, D.C.: National Archives and Records, unknown publish date), Year: 1860; Census Place: Montezuma, Cayuga, New York; Roll: ; Page: 754; Image: 277. [S65] 1920 United States Federal Census, online , Year: 1920; Census Place: Mentz, Cayuga, New York; Roll: T625_1089; Page: 5B; Enumeration District: 37; Image: 1082. [S11] 1910 United States Federal Census, online , Year: 1910; Census Place: Mentz, Cayuga, New York; Roll: T624_928; Page: 7B; Enumeration District: 0048; Image: ; FHL microfilm: 1374941. [S2] 1880 United States Federal Census, online , Year: 1880; Census Place: Mentz, Cayuga, New York; Roll: 814; Family History Film: 1254814; Page: 160A; Enumeration District: 027; Image: 0242. [S1] 1870 United States Federal Census, online , Year: 1870; Census Place: Mentz, Cayuga, New York; Roll: M593_; Page: ; Image: . [S8] 1855 New York Census, Record Type: New York State Census, Aurelius census transcription. [S3] Ancestry.com, 1840 United States Federal Census (n.p. : Online publication - Provo, UT, USA: Ancestry.com Operations, Inc., 2010. Images reproduced by FamilySearch.Original data - Sixth Census of the United States, 1840. (NARA microfilm publication M704, 580 rolls). Records of the Bureau of the Census, Record G, unknown publish date), Year: 1840; Census Place: Butler, Wayne, New York; Roll: ; Page: . [S20] Ancestry.com, 1830 United States Federal Census (n.p. : Online publication - Provo, UT, USA: Ancestry.com Operations, Inc., 2010. Images reproduced by FamilySearch.Original data - Fifth Census of the United States, 1830. (NARA microfilm publication M19, 201 rolls). Records of the Bureau of the Census, Record Gr, unknown publish date), Year: 1830; Census Place: Butler, Wayne, New York; Roll: ; Page: . Amanda (?) was born circa 1820 at New York, USA.1 She married Archibald Powell.